Dust-Off Canned Air Compressed Gas Duster - Nonflammable Dust-Off Plus delivers a clean, triple-filtered blast of nontoxic gas that quickly removes dust, lint and other contaminants from computers, CRTs, disk and tape drives, diskettes, media storage files and general office equipment. The Vector Valve rotates 360 degrees with a 180-degree vertical orientation so you can direct spray in any direction. Great for hard to reach places. Unique nozzle allows you to keep duster upright while delivering a cleaning blast to difficult-to-reach areas. 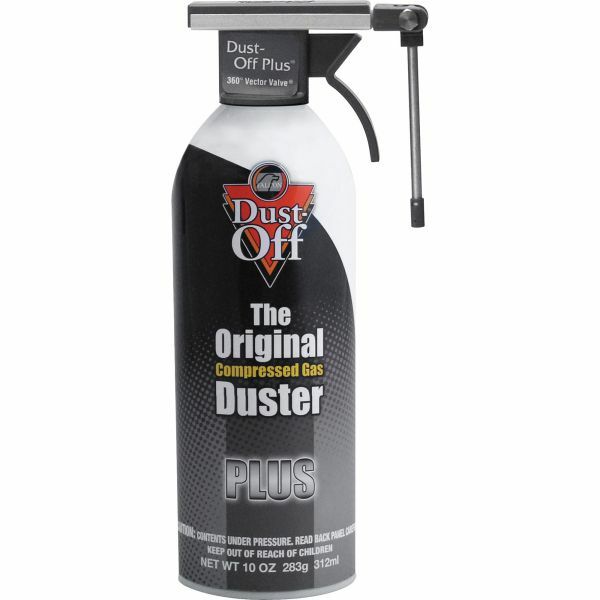 Duster contains 100 percent ozone-safe gas and has no CFCs, HCFCs, propane or butane.